Francis Joseph "Bucko" Kilroy (May 30, 1921 – July 10, 2007) was an American football player and executive. Kilroy was born in the Port Richmond section of Philadelphia, where he attended St. Anne's grade school before attending Northeast Catholic High School and then Temple University. As a Junior at North he played on the Falcons Championship team of 1937. 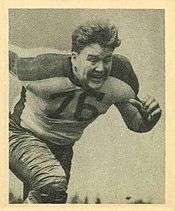 Kilroy was originally recruited by Notre Dame but went on to become one of the finest linemen in Temple football history. He starred for the Owls in the 1940 and 1941 seasons, helping Temple defeat rivals Penn State, Bucknell and Villanova in the same year for the first and only time in school history. He played both offense and defense and started every game in 1941 en route to becoming the first Temple football player to receive Honorable Mention All-America honors. In 1942 & part of 1943 he served in the Merchant marines during World War II. Asterisk (*) denotes acting general manager. Pound sign (#) denotes de facto general manager.